It’s with a heavy heart that I type this post. I really can’t believe that my maternity leave is coming to an end! 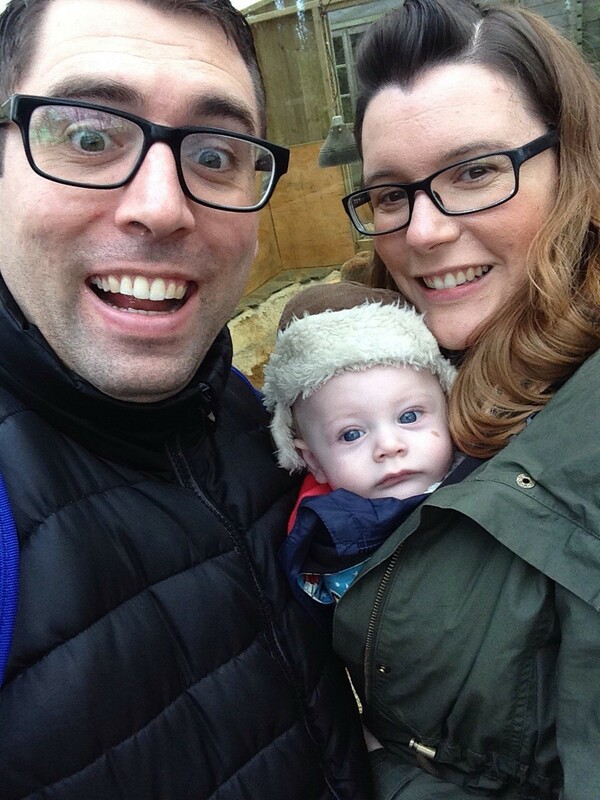 It’s been fabulous having 9 months off with Baby Lighty – and a month off before that, when Mrs Lighty was the size of a starter home and could barely do more than lie on the sofa watching Homes Under the Hammer – and now it’s all coming to a sudden end. I say sudden, but that’s not strictly true. I always knew it would come to an end, and even what date I’d be going back to work. It just feels so, so sudden; those 10 months have flown by, and ok, I know I’ve had a little tiny person to raise, but where has that time gone?! When did my bump become a newborn, and when did that newborn reach six months old, and when did that six month old become a nearly 9 month old who I’m going to be entrusting to another person to look after while I go back to work? There’s logical answers, or at least dates, that I can attribute to all of these points, I know, but my maternity leave seems to have zoomed by. As the end of my maternity leave draws ever closer, I have had the fears that every mum has. Will my baby be ok being looked after by someone else? Will he resent me for working? Will our bond be broken? Will he forget who I am? I feel like I want to spend every waking moment with Baby Lighty so as not to miss anything (which in itself is daft, as I won’t be able to spend every moment with him when he starts school, or when he’s all grown up and the last thing he wants to do is spend time with his old mum, as Mr Lighty pointed out). A fabulous post by The Son and the Moon has helped me to put my fears to one side somewhat, and I have vowed to try to enjoy the time I had left (sounds like I’m passing on rather than returning to work! ), but an overriding fear still remains: have I wasted my maternity leave? 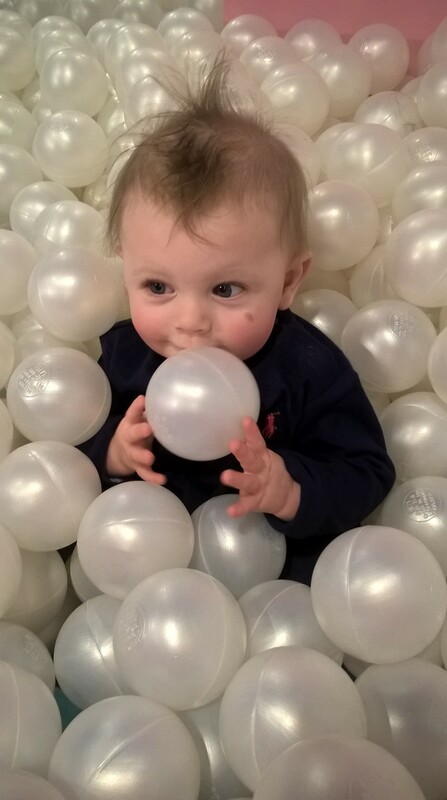 This fear has largely been sparked by my biggest and daftest dose of mummy guilt to date: back when Baby Lighty was 5 months old, I booked a session of messy play, and in all honesty, he hated it. Hated the feel of the paint on his hands, wasn’t too keen on having to wear the overalls, didn’t like all the touchy feely bits and pieces. 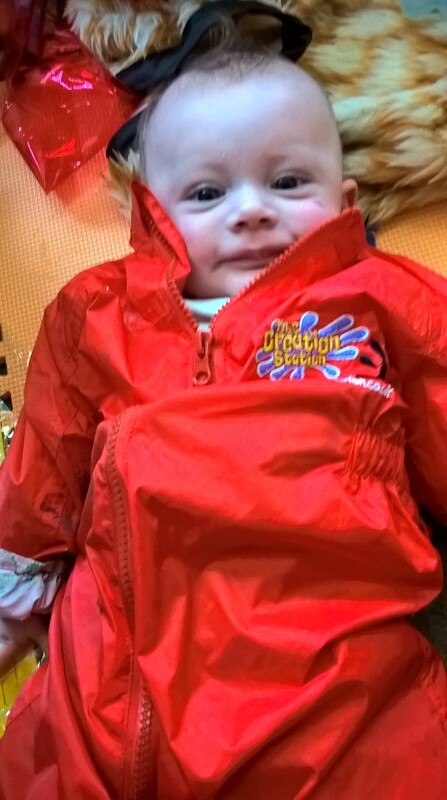 Looking back, I think he was probably just a little too young for it, but I still kicked myself so hard for not booking the by-that-time-fully-booked baby sensory course instead; I felt so guilty that I cried on the bus on the way home. Completely daft, but that’s what mummy guilt will do to you! Looking oh-so-cute in his messy play overalls, even if it wasn’t for him at the time. So the fact that I haven’t really done any specific baby classes, coupled with the timing of Baby Lighty’s birth meaning that once I was new-mum-ready to get out and about it coincided with all the baby groups stopping for the school summer holidays, has left me feeling like I’ve squandered this precious time off. We’ve seen our friends lots. We’ve made new friends, we’ve reconnected with old friends and we’ve had play dates with friends with older children too. We’ve been to soft play. We’ve been to various parks. We’re regulars at the library’s rhyme time. We visit one particular baby group almost every week, and have popped into others, too. We’ve done lots of shopping! We’ve been away three times, firstly to our friends’ wedding in Scotland, then to Centerparcs, and also to Great Aunty Tempy’s at New Year. We’ve celebrated two first birthdays, two 30th birthdays and two weddings. We did lots of lovely Christmassy things. We’ve been a part of the Women’s Institute’s centenary celebrations. We’ve had days indoors, snuggling on the sofa and playing with our toys. We’ve visited and been visited by family regularly. We’ve had lunch and coffee dates. We’ve enjoyed lots and lots of family days out with Mr Lighty, making the most of our National Trust membership and also visiting lots of farms, zoos and wildlife centres and even the likes of The Essex Police Museum and an antiques centre! A family day out at the zoo! So why is it, that despite all of this, I still feel like I haven’t really relished my maternity leave? Why do I look at other mums pushing smaller babies in prams with a mixture of longing and jealousy, knowing that they are at the start of their maternity leave? It suddenly dawned on Mrs Lighty: it’s because it’s the little things I’m going to miss the most. It’s the snuggling on the sofa after breakfast, it’s the looking at the pictures of the teddies on Baby Lighty’s nursery wall together after getting him dressed for the day, it’s dancing together to the radio, it’s watching Baby Lighty’s personality develop, seeing him hit his milestones. And I know I’ll get some of this on my days off, but above all else, I’m just going to miss Baby Lighty so much. So, new mummies, regardless of how much you cram into your maternity leave, regardless of how many classes you attend, please cherish the small moments, as they really are the true sign of a maternity leave well spent. Next → Next post: Does the M25 Know?! You missed off meeting your online mummy friends (we deserve a special mention right 😉) you’ve done loads though!! Definitely not a wasted leave! I feel like my return to work is creeping up on me – Baby Jones is 7 months tomorrow!! But even when you are back at work, you’ll make the most of those days at the weekend you do have off to spend with Baby Lighty – I bet you’ll be surprised by how much stuff you can cram into your weekends now! Good luck with your return to work, I’m sure it’ll be like you never left…. Thank you, I know you’re right. And you all have your own dedicated post!!! 😳😆 It’s mad how quickly our babies have grown up, isn’t it?? Haha very true, I haven’t even mentioned you yet – bad blogger I am 😂😂 so crazy how fast it’s gone! This is such a beautiful post lovely and I can feel your emotion at coming to the end of your mat leave. I remember feeling just the same, but you will probably find that the thought of going back is much worse than the reality. It sounds like you have had a brilliant time on mat leave, but going back to work is not the end of the chapter. This is your life now and that isn’t changing. You’ll just find time to squeeze a few hours / days of work in on top of all the amazing things that you will continue to do as a family. Good luck, and enjoy the hot coffee (and buy yourself a teeny tiny handbag that does not contain a single baby wipe). Lovely post. 🙂 I’m starting mat leave in 10 days and I will try and remember every day that I mustn’t take it for granted. It sounds like you did LOADS with your time (at this point, I’m imagining that getting both baby and me dressed in the morning is going to count as an achievement) and I hope going back to work isn’t too difficult! I totally felt the same about the end of my maternity leave. The first week or so of childcare was rough, but now she is almost 18 months and will run into her classroom to see her friends. Enjoy these last few weeks!! Push that mummy guilt aside (easier said than done, I know!!) you have done loads!!!! I think because it goes in a flash, plus the combination of baby brain/mummy memory, it can be easy to think you didn’t do enough! But I’m sure the baby would’ve been happy with being cuddled on the sofa all day! This is such a lovely post, and your love for little Lighty, and the way you have treasured your time together, really shines through! I’m sure the transition back to work will be fine, with the added bonus of uninterrupted coffee and toilet breaks! Let us know how it goes, and thank you so much for joining us at the very first #bigpinklink! Good luck for your return to work! I was supposed to go back after 4 months, but it was just impossible. I feel thankful every day that I’m still home many months later, watching my son try to balance peas on top of his head at dinner time 😉 I think it doesn’t matter how much joy you squeeze out of your maternity leave it will never feel like enough when the end is near, but once everyone settles into the new routine there’ll be new things to be grateful for. Good old fashioned mummy guilt! Even if you’d carefully planned out each week with specific activities and bonding sessions you’d still feel guilty about something. I hated going back to work this third time even though I like my job and I’ve had to rethink the way I work. Enter blogging! Baby Lighty will love childcare I’m sure and you’ll regain some of you again. It does make the time you do spend together more precious. 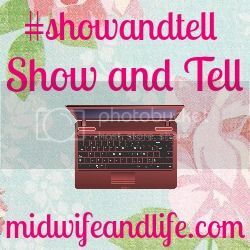 Thank you so much for linking up with #showandtell, hope to see you back again this week!